Ediția 2016 a tradiționalului eveniment inițiat și organizat de Nadia Comăneci și Bart Conner a reunit peste 1600 de participanți, un număr record, în Cox Convention Center din Oklahoma City. 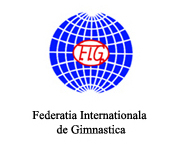 Între foarte tinerele competitoare fiind și gimnastele noastre Carmen Glăvan, Laura Iacob, Carmen Ghiciuc și Adriana Stanciu, însoțite de antrenorul Florin Cotuțiu. Reprezentantele noastre au avut o frumoasă comportare, la individual compus ocupând locul 2, prin Carmen Ghiciuc, și 3, prin Laura Iacob, în timp ce la echipe s-au clasat pe poziția secundă, rezultatele fiind înregistrate în concursul junioarelor dîn cadrul ”Nadia Comăneci Internațional Invitational”, varianta feminină a acțiunii ”Bart & Nadia Sports Experience”. ”Coached by Yelena Davydova, the 1980 Olympic champion, Gemini senior Meixi Semple and her junior teammate Jade Chrobok each won their respective all-around titles, and the pair defeated defending champion Romania-Deva, 113.000-110.450. 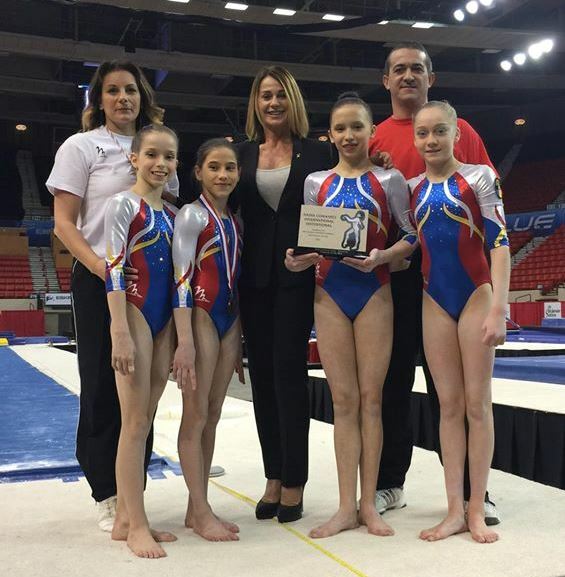 Dynamo (Ontario), coached by Elvira Saadi, finished third with 106.800, and Gym-Fly was fourth (106.050). Semple’s 57.100 easily defeated runner-up Mackenzie Parker (Pegasus, 53.350), while Laurie-Lou Vesina (Gym-Fly) finished third with 52.750. Semple, who placed sixth at Elite Canada last weekend, was superb on beam in the final rotation, where she scored 16.000, the highest mark in the entire competition (front aerial; flip-flop, layout, flip-flop; side somi; switch leap, switch-half; side aerial; double twist). 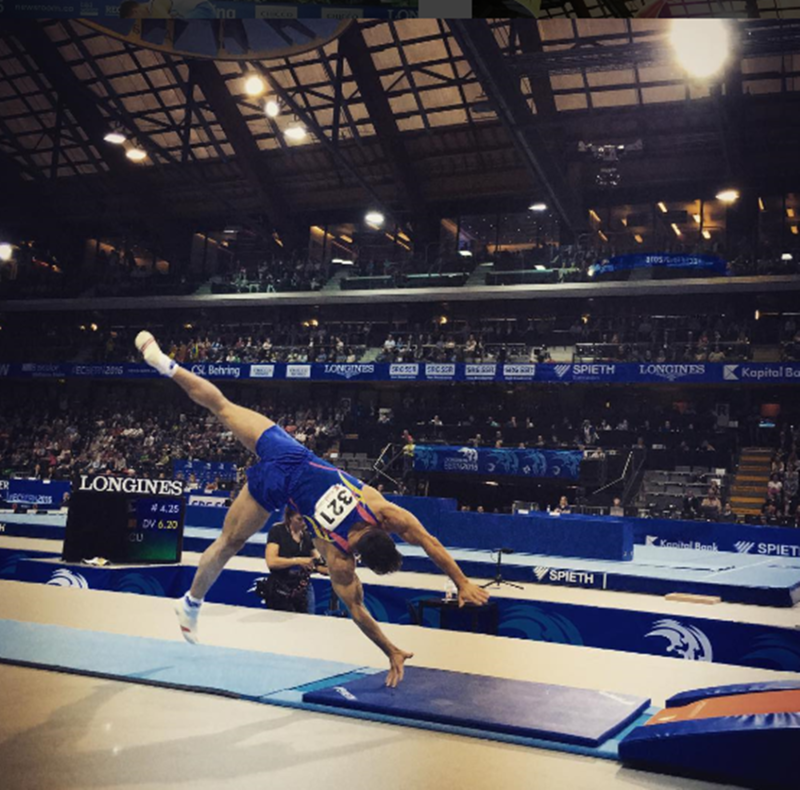 Parker’s top effort came on floor exercise, where she tumbled a powerful double layout (14.300). Vesina, whose team trains under Jacinthe Emard in a converted Catholic Church in Quebec, showed some of the most innovative skills in the meet. She and teammate Victoria Jurca (third at Elite Canada in juniors) vaulted round-off, full-on, piked Yurchenko, and Vesina dismounted bars with the free hip-back tuck that her coach used when she was a gymnast. Chrobok, the junior Elite Canada champion over teammate Ana Padurariu, 54.150-54.100, had another close win in Oklahoma City. She edged Romanian Carmen Ghiciuc, 55.900-55.800, and both were exceptional. Chrobok closed out her victory in the final rotation on beam, where she earned 15.600 for a packed routine: excellent leap series; side aerial, layout; double turn; front aerial; side somi; roundoff, double pike. 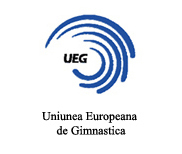 Ghiciuc opened her meet on uneven bars, and her body line and toe point was reminiscent of the great Ma Yanhong of China. Her best event was floor exercise (14.900), where she tumbled a triple twist, double tuck, 2.5 twist and double twist. 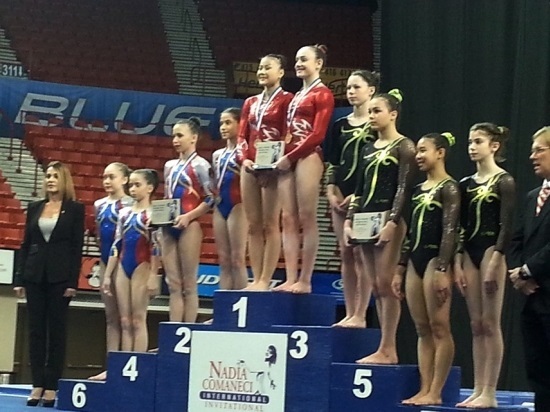 Grabbing third was Romanian Laura Iacob (53.900), whose top effort came on beam (14.850): flip-flop, layout; front aerial; side aerial; roundoff, double twist. Jurca was fourth all-around (53.300), tumbling a clean piked full-in on floor, and Dynamo teammates Stephanie Sim (52.5500 and Sayge Urban (52.400) placed fifth and sixth, respectively. Romanian Ariadna Stanciu was steady on every event but bars to finish seventh (52.050), and Brooklyn Moors (Dynamo), younger sister of Victoria Moors, who retired last year, was exquisite on floor and finished eighth (52.00). Montana Fairbairn (ninth, 51.00)) of Stampede City, coached by David and Judy Holmes, has been a mainstay at the Nadia meet for several years, and never fails to connect with the crowd with her ever-present smile. “She even smiles on beam,” quipped Judy Holmes. Megan DiPietro (Dynamo) rounded out the top 10 with a 50.650”.